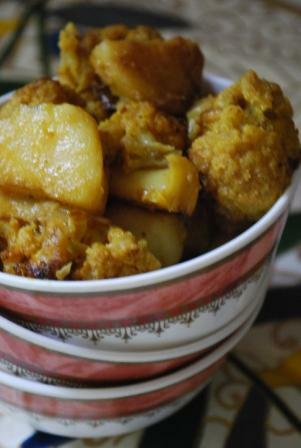 why would you fry potatoes and cauliflowers ‘separately’? I hate cooking & have resisted my mothers attempt to teach me even the basics. But now am lost, since I have to stay by myself and cry all day for the good old bengali food. so of sheer necessity have been surfing for recipes, and came accross this one. Result – I cant believe this! I actually did it!! First time I made something a decent and edible!! It actually tastes like the phulkopir torkari back home!! That’s such a great thing. I completely understand your feelings. I had gone through the same face 3 years back. Crying over my food, and then I started cooking and here I am. Wish you luck in your culinary ventures. So Sudeshna did you finally become an expert cook? This is my 8th month away from home and I am sticking to Dimer Jhol, Fulkopir Torkari & Doi-Mangsho. Can you suggest some more easy dishes I can try my hand at? Yes I am a good cook (coming out of the modesty shell, I have become an expert one :D). I am sure you’ll be able to find begun in the nearby farmer’s market as eggplant in US or aubergine in UK, or else in any Indian store. If you find it, then you can try the bengun marichut, its very easy nd very delicious preparation. Thats a great testimonial indeed. Thanks Ratul.